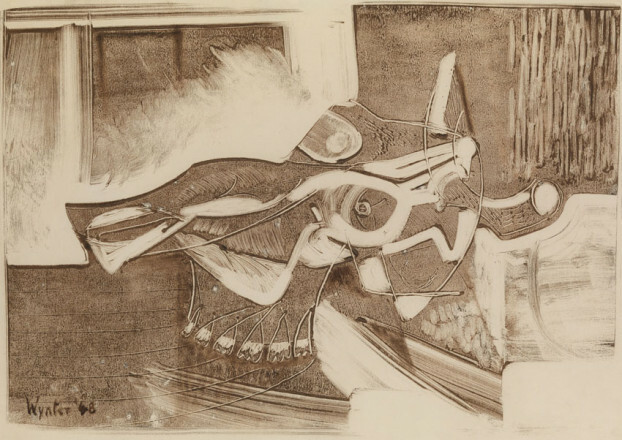 COW'S SKULL 1948 Bryan Wynter (1915 – 1975)	P742 © Estate of Bryan Wynter. All rights reserved, DACS 2015. SCOWLES 1960 Bryan Wynter (1915 – 1975)	P3041 © Estate of Bryan Wynter. All rights reserved, DACS 2015. KAYAK 1961 Bryan Wynter (1915 – 1975)	P361 © Estate of Bryan Wynter. All rights reserved, DACS 2015. 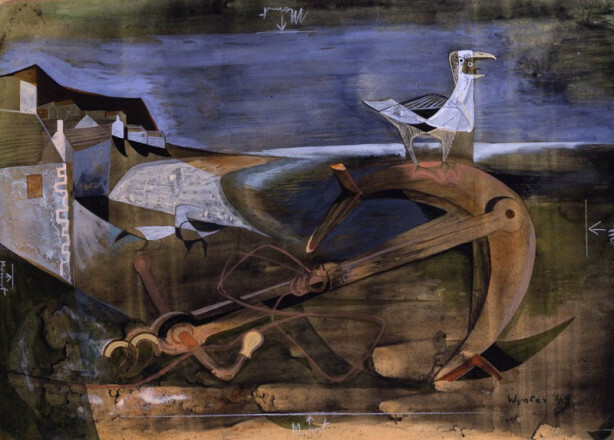 FORESHORE WITH GULLS 1949 Bryan Wynter (1915 – 1975)	P128 © Estate of Bryan Wynter. All rights reserved, DACS 2015. BLACK SUMMER 1959 Bryan Wynter (1915 – 1975)	P3042 © Estate of Bryan Wynter. All rights reserved, DACS 2015. 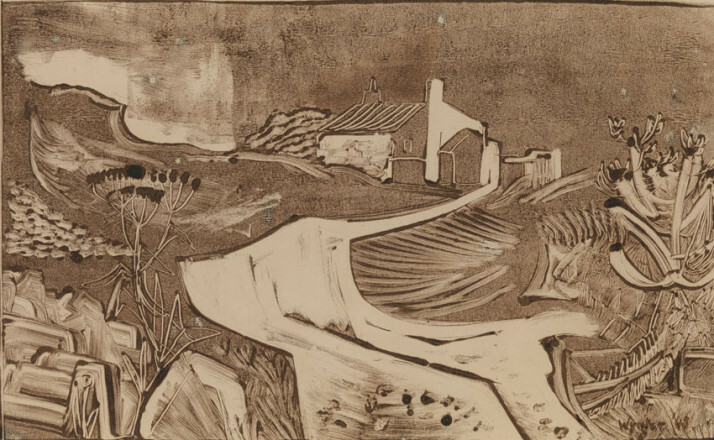 DISPERSAL POINT 1959 Bryan Wynter (1915 – 1975)	P300 © Estate of Bryan Wynter. All rights reserved, DACS 2015. Bryan Wynter was born in London, after school he was sent to Zurich to study in the hopes he would join the family business. In 1938 he rebelled and returned to London to study at the Slade School of Fine Art. At the outbreak of World War II, he registered as a conscientious objector and spent the war years working on land drainage and, for a time, looking after the monkeys belonging to Solly Zuckerman, the biologist. 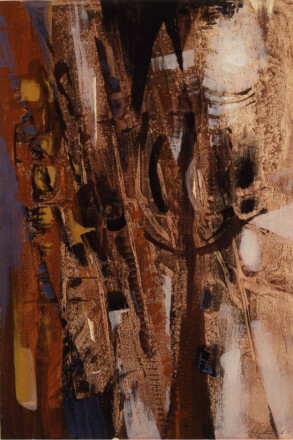 In 1940 he moved to St Ives in Cornwall and was associated with the St Ives group of artists that included the artists Peter Lanyon, Terry Frost, Patrick Heron, William Scott, Roger Hilton and others, who after the war formed a strongly-linked and influential ‘colony.’ For the first ten years he painted Cornish subjects on a small scale in gouache and watercolour; the scale dictated by the restrictions of living in a small cottage. The subject matter was recognisably Cornish - gulls and fishing boats and the harsh, bare landscape. 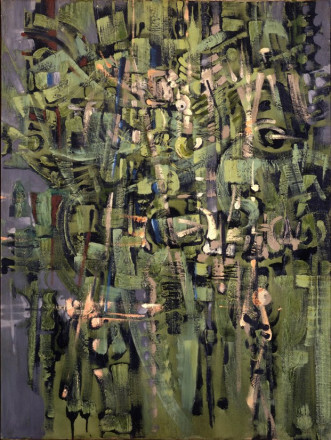 In the 1950s had has taken part in experiments with mescaline, which may have had an effect on his work as it became progressively more abstract. 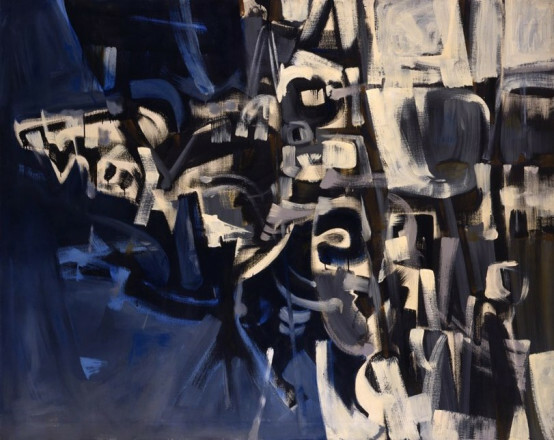 By 1956 he had evolved a non-figurative system using a much larger format, which he retained and developed during the remainder of his career. But the source of inspiration was the same as it had always been - the natural landscape of Cornwall but, as he wrote, approached ‘from the other side'. In 1962 he suffered a heart attack, in spite of his lithe spare frame and his enjoyment of physical activity, in particularly swimming and kayaking. 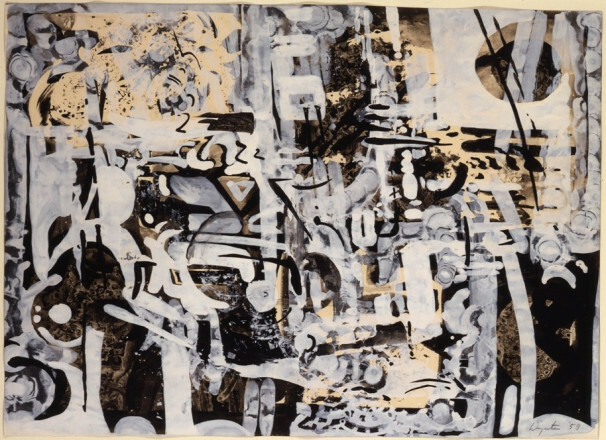 Following his illness he experimented for a time with kinetic art, before returning to painting in the last decade of his life.